Casa Margarida is one of 12 delightful villas in a gated condominium with a communal swimming pool at Espartal (Aljezur). This splendid and well-appointed villa is arranged over 2 floors. The first floor consists of: the master bedroom with double bed, en-suite bathroom (with bath) and adjoining balcony overlooking Amoreira beach and the surrounding countryside; a twin bedroom with 2 single beds, en-suite bathroom (with shower) and balcony overlooking the swimming pool. On the ground floor Casa Margarida has a twin bedroom with 2 single beds and a separate a bathroom (with shower) which can be used as a private bathroom for this bedroom. All bedrooms have fitted wardrobes. The open aspect lounge and dining room lead to the fully equipped kitchen with dishwasher. 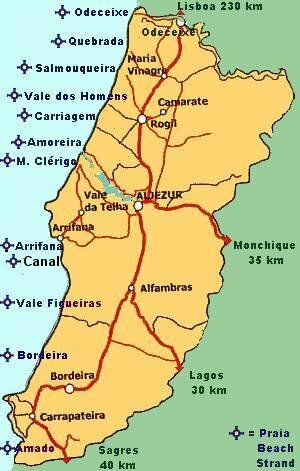 Portuguese TV channels, a DVD player, books, games and puzzles for all ages are provided for entertainment. The kitchen and lounge both lead to a ground level terrace for which outside dining furniture is provided. Monte Cl�rigo beach is within easy walking distance, whilst Amoreira beach can be approached across the estuary at low tide. Arrifana beach is only a short drive away. Prices are for 6 persons. A further 100 € per week is payable for use of the sofa bed. All bed linens and bathroom towels are provided.